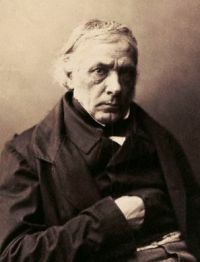 French philosopher, promoter of spiritual eclecticism, after 1830 he was the official philosopher of the Orleans monarchy. Main works: Fragments philosophiques (Paris 1826, 1833, 1838); Cours de l'histoire de la philosophie. 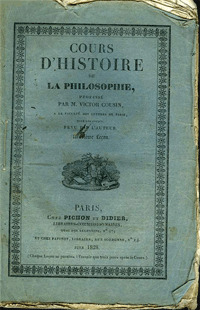 Introduction à l'histoire de la philosophie (Paris 1828); Cours de l'histoire de la philosophie. 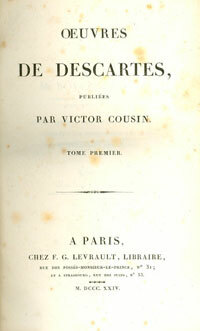 Histoire de la philosophie au XVIIIe siècle (Paris 1829); Du Vrai, du Beau, du Bien (Paris 1853). Bibliography: Victor Cousin, mis en œuvre par P. Vermeren, «Corpus», 1991, n° 18-19; J.-P. Cotten, Autour de Victor Cousin. Une politique de la philosophie, Paris, Les Belles Lettres 1992; P. Vermeren, Le jeu de la philosophie et de l'État, Paris, L'Harmattan 1995; R. Ragghianti, La tentazione del presente. Victor Cousin tra filosofie della storia e teoria della memoria, Napoli, Bibliopolis 1997; Id., La biblioteca platonica di Victor Cousin, in F.M. Crasta (ed. ), Biblioteche filosofiche private in età moderna e contemporanea, Firenze, Le Lettere 2010, pp. 225-235. The library of Cousin was willed to the Université de France with explicit instructions that it was not to be shelved along with that of the Université, but kept at the Sorbonne, where it can still be found under the name of Bibliothèque Victor Cousin. In addition to books there is a large collection of manuscripts (cf. Catalogue général des manuscrits des bibliothèques publiques de France. Université de Paris et Universités des départements, Paris, Plon-Nourrit 1918).The original collection has been added to by numerous bequests and new accessions. There are currently two catalogues, alphabetical and by subject, at the Bibliothèque Victor Cousin. These were drawn up in the decades immediately after the creation of the Bibliothèque, and a new alphabetical catalogue has been more recently created as well. The different document summaries do not however give indications about which books effectively belonged to Cousin. Bibliography: F. Chambon, Rapport sur la Bibliothèque Victor Cousin, adressé à M. le Ministre de l'Instruction Publique, Paris, 1908. The notary inventory, begun on 18 February 1867, is drawn up without any particular order, and only contains the indication of the different rooms in which the library of V. Cousin was shelved, for more than 15,000 volumes. In order to allow the users to access some of the enormous quantity of documents listed in this catalogue, some relatively homogeneous sections, containing a limited number of titles, have been identified. Within each section the order of the inventory has been followed. For example, in the subsection with volumes numbered 7860-7951 with the sequence “Fludd, Ockam, Pic, Arnauld, Duns Scot, Volney, Abélard”, it is understood that the first volume of each of these authors is in the same sequence as the notary list. That does not prevent, however, works by the same author appearing in several places in the same section in no particular order. Denominations like “aristotélisme”, “philosophie hégélienne”, “école écossaise”, include both the primary and secondary literatures. Even though sections have been broadly defined, it was not obviously possible to account for those books whose topic seemed to be outside the criteria of the subsections. For example, in the section which contains the volumes numbered 5402-5887, containing books of “philosophie anglaise, Locke, Herbert, Bacon, Hobbes, Cudworth, More, Toland, Berkeley, Clarke, Hume, Smith, Mandeville, Hutcheson, etc.”, the text by Grozio, numbered 5830, will not be included, and in the same way a manual of chemistry which is located in a fairly homogeneous group of Greek philosophy texts will not be indicated in that particular section. Given this information, it is evident that in order to have a complete knowledge of the library of Cousin one must scan the entire inventory: the classification adopted here can only offer support to consultation. From no. 14355 on, the inventory seems to have been written by another person, with a quite different handwriting. At least some of these subsequent books did not belong to the philosopher, because they were published after his death, and on the first page of the inventory there is written in pencil: “3 tomes cet inventaire est le majeur; les nouvelles acquisitions y sont portées”. Inventaire de la bibliothèque de Mr. Cousin commencé le 18 février 1867, T. I.
Inventaire de la bibliothèque de Mr. Cousin commencé le 18 février 1867, T. II. Inventaire de la bibliothèque de Mr. Cousin commencé le 18 février 1867, T. III.